Wren’s most perfect Christmas ever is turning into a nightmare. 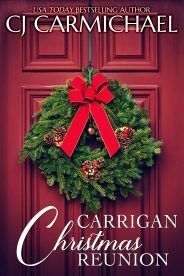 The Carrigan family is in chaos with various medical issues, no one has put up the tree or done any Christmas baking. The only bright spot is Harris Quinby, a ranch hand at the Circle C, who manages to be there for Wren every time her family lets her down. Harris Quinby has never forgotten the summer Wren spent on her grandfather’s ranch when she was fourteen and he was sixteen. She’d changed his life that month, and now he finally has the chance to thank her…but what if he falls in love with her instead? This was going to be the best Christmas ever! Wren Bishop stepped out of the Bozeman airport, pulling her luggage behind her, and filled her lungs with sweet Montana air. She felt like tossing her red wool cap in triumph. After six months mired in academia at the University of Colorado, she needed a break. She couldn’t wait to catch up with her twin sister Portia, get fussed over by her favorite aunt Callan and snuggle in for a big hug from her mom. Last year she’d skipped the holidays to work on her thesis. The sacrifice had been worth it—she now had her master’s. But she’d missed her family and their holiday traditions more than she’d expected. Sipping hot chocolate around the fireplace at the old ranch house. Baking with her mom and aunts in the roomy country kitchen. Playing with her cute little cousins and her nephew Zavy. Getting all dressed up for Christmas Eve service, followed by Death by Chocolate at her aunt Sage’s. Best of all was Christmas morning, opening stockings, lazing around, then the big rush to prepare a traditional dinner with her late grandma Bramble’s recipes. Wren even thought she could face, with a smile no less, the traditional tea with grouchy Great-Aunt Mable at Bramble House. Aunt Mable always found something to criticize about everyone, but what did that matter when there was so much else to look forward to? Not the least the big “surprise” Wren’s boyfriend had promised. She and Adrian Bowker had been going together for more than two years. He was spending a few days in Denver with his folks, but would be flying in to Montana on Christmas Eve. Wren was almost positive he’d be bringing a ring…and making a proposal. And she, who had pitied her sister Portia for getting married and having a baby so young, she, who had been so anxious to put education and career ahead of everything, was thrilled. Somehow over the past year her priorities had shifted. Learning, debating, researching—all activities she still loved—were being overshadowed by a longing for something more. Something involving love, a special man, a home that wasn’t shared with three other roommates, and maybe, eventually, a baby. A gust of cold air splashed over Wren’s face and snaked past the open buttons of her coat. She clutched the collar of her wool jacket tightly to her throat and scanned the lines of vehicles crowding the arrival lanes. Wren had texted her twin from the baggage carousel. I’m here! I’ll be waiting outside for you. The plan was for Portia to pull up to the main doors after that signal. But Wren saw no sign of her. She checked her phone and saw that a text had just come in. Before she could open it, she heard her name. A blond man in his late twenties and wearing a lined denim jacket waved a brown suede cowboy hat in the air. He smiled and his blue eyes twinkled as if he knew her. Wren drew a blank. Surely she’d remember a cute guy like that if she’d met him before. Then a very old memory surfaced. Wait a minute. Was that Harris Quinby? Wren pushed her sunglasses up on her head. They’d been teenagers last time she saw Harris, but with a closer look at the approaching man, she knew she was right. His shoulders had filled out, he’d grown a few inches, and his jaw was firmer. But his hair was still yellow as corn silk, and his eyes were still a perfect match for the great western sky. Like her, he wasn’t wearing gloves, and she was surprised how warm his calloused palm felt next to her skin. Last time she’d seen him, he’d kissed her. She’d been fourteen. Her first kiss. She’d thought she was in love…silly her. Before she could ask what he was doing, he collapsed the retractable handle and picked up both her carry-on and her larger bag. She stared as he strode toward the curb. Watched as he loaded the bags in the back seat of a dark blue, dual-cab truck. “I’ll explain on the drive,” Harris promised as he opened the door for her. Wren hesitated, calculated the risk, decided it was minuscule, and climbed in. Soon they were on the highway, headed west for Marietta. Harris’s hands on the steering wheel looked strong and confident. Wren took a closer look at Harris’s profile. She remembered one especially hot day when they’d taken two horses out to the creek and gone splashing in the chilly, gurgling water. Another time he’d interrupted his work to show her a sweet little fawn hiding among the overgrown grass at the side of the road. Funny she hadn’t thought of Harris for a long time, but now so many memories were coming back. “Um…so that explains why Portia couldn’t pick me up. But why did she ask you to do it?” She almost said “you of all people” but caught herself in time. It was a long drive from Marietta to Bozeman and she didn’t want to sound ungrateful. “Callan was too busy?” Callan was her mother’s youngest sister and Wren had always felt particularly close to her. “Of course. She’s expecting end of January.” The family had been wondering if Callan would ever stop obsessing about her beloved foals and calves long enough to start her own family. Wren’s mom had been so excited when she’d called to share the news it was finally happening. “I see.” She supposed her other aunt, Sage, was super busy with the chocolate shop at this time of year. But what about her mother or stepfather Nat? They’d driven to the Circle C from their ranch in the Flathead Valley a few days ago. Weren’t they as excited to see her as she was to see them? His grin brought back another memory of that long-ago summer. Harris sneaking up on her as she read under the shade of an old cottonwood. He asked about the book, which had been Lord of the Flies, and after she explained the plot he teased her about reading such heavy subjects on her summer holiday. Still, he asked if he could borrow the book when she was finished, and two days later he’d sat down with her during his coffee break to discuss the main themes of the story. All this had happened the summer when she was fourteen and he was sixteen. She and her sister had been sent to spend four weeks with their grandfather on the Circle C Ranch where Harris was working for his summer job. Mostly their grandfather ignored them, but that had been okay. Portia made friends with some of the cool kids in Marietta and spent most of her time with them. Wren stuck close to the ranch, searching out quiet places to read, slowly making friends with Harris. “That’s not the way I remember it. Have you forgotten the kiss?” He raised an eyebrow suggestively. Wren couldn’t believe she was blushing. “No. I haven’t forgotten.” She’d daydreamed about that kiss for at least a year after it happened. “Is that so?” He’d been her first kiss, her first crush. But she’d never been quite sure how he felt about her. They shared a few more stories from the past, then Wren asked about his mother and grandparents. Kirsten Quinby had been a ballet instructor in New York City until she’d been struck in a crosswalk by a speeding taxi. She’d ended up with back issues that forced her to retire from the work she loved so much. She’d taken her six-year-old son home to live with her parents and that’s how Harris had ended up in Marietta. Wren, who loved books with a passion, still thought it was way cool that you could make a living creating indexes for books. The career wouldn’t work for her, though. She’d get too distracted reading to get any work done. Wren was so wrapped up in their conversation she barely registered the scenery and so she was surprised when the rustic entrance gate to the Circle C came into view. “We’re here already.” She drank in the familiar view, the backdrop of mountains, the snow-covered fields, the ranch house and outbuildings. It was dusk now, and she was surprised there were no Christmas lights on the stately Douglas fir in the front yard. “I’ll bring in your luggage then get out of your hair.” Harris was out of the truck a second after shifting into park. Wren felt vaguely disoriented as she paused in front of the familiar log home, built by her ancestors and currently Callan and Court’s home. Though her grandparents were both dead, her mother and three aunts kept their memories alive for the grandchildren. 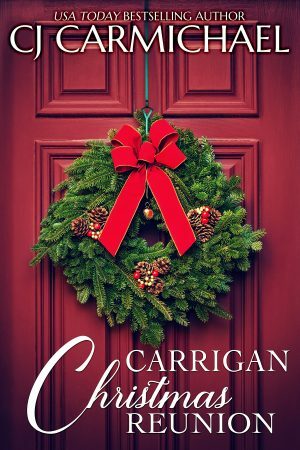 The Carrigan family—through all the good times and hard—remained tight-knit. So it was hard to believe there was no one standing on the porch waiting to greet her. No delicious cooking aromas, no Christmas lights, heck she couldn’t even smell any hickory from the wood-burning fireplace. She watched as Harris deposited her bags in front of the door. An emotion flashed through Wren, unexpectedly unsettling. As if she’d been caught out doing something wrong. Which was ridiculous. “Yes. Adrian will be flying in on Christmas Eve.” The fact that she hadn’t mentioned him during the long drive wasn’t significant. She and Harris had been talking mostly about the past. The subject of Adrian simply hadn’t come up. Harris nodded, then moved quickly, getting into his truck and driving off, not giving her a chance to say anything more. Wren felt a little sad as she watched him leave. Nostalgia? Then she turned to the door and peered through the glazed window into the darkened foyer. She hadn’t expected a parade or a twenty-one-gun salute. But some sort of welcome would have been nice. What in the world was going on with her family?